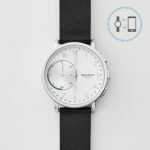 The Skagen Hagen Connected SKT1101P is a classic analog watch with �smart� features. It can sync via Bluetooth with Android and iOS phones. As for smart features, it can track activity, sleep, and let you know there are notifications. It is powered by a standard cell battery which can last for four to six months at a time � and is replaceable thereafter. This particular model has a stainless steel finish and black leather band.